The intense pain of a severe, acute diverticulitis episode is only one form of diverticulitis symptoms. Diverticulitis symptoms depend on many factors, including the location of the inflamed diverticula in the abdomen. Anyone who has ever suffered severe diverticulitis pain in their abdomen agrees it’s never something they want to experience again. However, the intense pain of a severe, acute diverticulitis episode is only one form of diverticulitis symptoms. Many more people suffer from chronic diverticulitis symptoms, which are characterized by less severe lower abdominal pain, bloating, constipation, and diarrhea. It’s fortunate that diverticuli usually don’t cause any symptoms, given how common they are: 50 percent of people at age 50 years, 60 percent at age 60 years, and almost 70 percent of people in their 70s and 80s are estimated to have diverticulosis, which is how the condition is defined when the presence of diverticula causes no symptoms. In up to 20 percent of people with diverticulosis, however, the diverticuli bleed or become inflamed or infected, leading to what is called diverticulitis. Abdominal pain, fever, and constipation are common diverticulitis symptoms, but, as you will soon see, medical researchers have recently discovered that the symptoms of diverticulitis are much more variable than traditionally thought. Diverticulitis symptoms depend on many factors, including the location of the inflamed diverticula in the abdomen, the severity of the inflammatory process, and the presence of complications (see below). Some people have a single, acute episode experiencing symptoms of diverticulitis, never to have the problem again. Other people may suffer from recurrent, distinct episodes. In these cases, the diverticulitis pain is often severe and comes on suddenly, but it can also be mild and become worse over several days. The intensity of the diverticulitis pain can fluctuate. 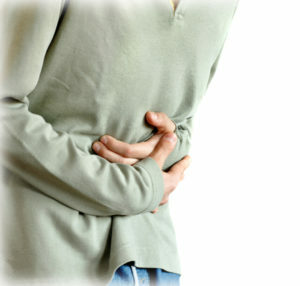 Occasionally, diverticulitis leads to bleeding; infections; small tears, called perforations; or blockages in the colon. Bleeding diverticula can lead to blood in the stool. Infected diverticula can form abscesses or can perforate and leak infected fluid into the abdominal cavity, which can lead to body-wide infection (sepsis), fever, chills, and severe abdominal pain. Fistulas may form if infection spreads outside the colon and causes the colon’s tissue to stick to nearby tissues, such as the bladder. This may cause chronic, severe bladder infections with associated pelvic pain. Scarring caused by infection may lead to partial or total blockage of the intestine, called intestinal obstruction. When the intestine is blocked, severe constipation, bloating, and pain occurs. For these complicated cases of diverticulitis, hospitalization and surgery are often required. Factors leading to symptoms in this chronic form of diverticular disease include low-grade inflammation, altered intestinal gut bacteria (microbiota), hypersensitivity of the gut tissue to pain, and abnormal gut motility. For these people, symptoms often include more vague abdominal pain and discomfort, bloating, constipation, and diarrhea. The onset of the IBS-like abdominal pain is often associated with a change in frequency and/or form (appearance) of stool and is typically relieved with defecation. Whether you have an acute, severe attack of diverticulitis or a more chronic form of the disease, new treatment options are available that don’t involve strong antibiotics or invasive surgery. While antibiotics and surgery have traditionally been the conventional treatments of choice, new evidence shows that they are typically not helpful or necessary. Not only that, but we now have enough research showing the benefits of natural treatments like probiotics and vitamin D that even conventional gastroenterologists are beginning to recommend them to their patients. If you have diverticulitis symptoms, seek out a healthcare provider who is up-to-date on the latest research that shows the benefits of natural treatments like probiotics, vitamin D, and more. Debunking Myths About Diverticular Disease. Medscape. Apr 07, 2014. Clin Gastroenterol Hepatol. 2013 Dec; 11(12): 10.1016/j.cgh.2013.04.048. Therap Adv Gastroenterol. 2013 May; 6(3): 205–213. abdominal pain, antibiotics, bacteria, bloating, bowel syndrome, change in bowel habits, chronic diverticulitis, chronic diverticulitis symptoms, constipation, diarrhea, diet, diverticulitis, diverticulitis attack, diverticulitis attack symptoms, diverticulitis diet, diverticulitis pain, diverticulitis symptoms, diverticulosis, fiber, food, gut bacteria, ibs, ibs, infection, inflammation, irritable bowel, irritable bowel syndrome, irritable bowel syndrome ibs, lower abdominal pain, natural treatments, pain, pelvic pain, probiotics, severe constipation, symptoms of diverticulitis, symptoms of irritable bowel, symptoms of irritable bowel syndrome, vitamin, vitamin d, what does a diverticulitis attack feel like. I have had diverticulitis for 15 years with many episodes of Infection described by my specialist as only a low grade infection, but I have for the past six to eight months felt symptoms of pain bloating chronic diarrhoea, only to be dismissed as suffering from IBS, I cannot get any help and am at the bed of my tether,this article is very interesting and I would like to know where I can find a dr who can help me. Will diverticulosis make you feel tired. I habve complained about the pain was just told friday this is what they. Found on my ct scan. Yes, it can make you extremely tired…..you feel like you have the flu. Plus pain and fever. Can Diverticulitis cause pain in your side and/or even lower back?? I was just diagnosed with diverticulitis today via colonoscopy. However, I have been battling this for over two years and recently had a very bad flare up which left me bedridden for the better part of a month. It wasn’t until I started working with a naturopath who is vert knowledgeable with gut health that my health has started to improve and my symptoms to become alleviated. Thirteen????? If your reading this, you better figure out what flares you up & really watch your diet!! I am #49. Just got discharged from my 4th hospital stay, & my second time being sepsis. I’ve been told by a specialist the seeds & nuts myth are a bunch of bunk! This physician owns his own colonoscopy clinic. I just don’t know who to believe!!! My hosp discharge paperwork says to eat nuts, cause your body absorbs protein from them. The older you get, the scaryer, because your body just gets weaker in fighting off infection! My best friends mom, died from diverticulitis & was septic, couldn’t fight the infection. Manta doctors tell me to remove a section of my colon. Well, this hospital visit, I got it in a different part of my colon. So, then remove my small intestine & large intestine, & wear a colostomy bag??? If you have an emergency surgery, then you have no choice, but to have a colostomy bag, for around 6 mo. Then you have surgery all over again, to be resected back. I don’t want to do it twice!! I’m so not sure what to do! I know that boiled cabbage is good for it, & sour kraut. I’ve also the last two times, gotten soar eares!!! I was diagnosed with polycondritis. I have a gal I work with that says she gets soar ears with it as well!! I’m trying to figure out what this has to do with it? It’s a cartilage issue. So, soar ears help me to know I’m getting an onset. This Co worker, is the first person I’ve ever heard of, to also have this issue. Good luck everyone. I have had diveticulitus. The worst thing is my severe insomnia. I am so tired for so little or no sleep I have to spend time on the couch all day crying. This has ruined my life as I’m too exhausted to see from so little sleep and don’t see my friends and socialize because of it. I had to wait months to so a gastrointestinologist and now I’ve been told I have to wait several more months for my colonoscopy. This is like going through hell! This past weekend I was at the hospital being diagnosed with diverticulitis. Yeah! Well turns out I need to eat more fiber. Don’t know how to do this, since I had my gallbladder removed 3 yrs ago and am not able to process fiber well! Very confused on both issues. The ER Doctor was very nice in explaining to me what I need to eat, more high fiber foods and stay away from seeds, legumes and nuts. Then I read that they are ok to eat! Plus without my gallbladder, I get diarrhea just about everyday. So I stayed away from fiber filled foods. Catch 22. My question is, how do I deal with this situation? I’m going to be seeing a gastrointerologist next month and any thing you can suggest between now and then, will be very helpful. Thanks in advance. I had been dignose with divieticulites and yes it does feel like labor pain it’s something that truly hurts. Don’t eat seeds, nuts, popcorn, anything that is difficult to digest. Also regular corn as well. Eat high fiber, but be very cautious for seeds…like blackberries, strawberries, tomato seeds (ok to eat the outside). Trust me I have tested these theories on myself and every time I eat a seeds, I get an outburst. Sometimes the outburst happens in a few days, otherwise it can take a couple of weeks. I have logged this and know this is the truth. I was diagnosed in September I had a little diverticulitis and needed to eat fiber. I did good till last few weeks I got off wagon of eating fiber. I had a very bad episode over Thanksgiving week I had to go to emergency room with bad chills and severe abdominal pain, nausea, they done test it showed bad infection diverticulitis. I will be eating right and I hope to not have another episode like this it was awful. I had a attack 12 years ago with Diverticulitis. I have had no attacks since then besides back in October of this year. Now two months later I’m having symptoms again. I have not changed my diet or anything. I’m hoping this is not leading to further complications. I heard from someone that if you have two or more attacks in six months that surgery is likely. Anyone had this happen?? I was driving in my car a week ago & suddenly started getting stomach pains. Brought back memories to 35 yrs ago when I use to get spastic colon. Well went to Dr, and she suspected bacterial infection from fast food I ate the night prior, told me liquid diet & prescribed meds for cramping. Went back to Dr 3 days ago because it wasn’t getting better & she asked me if I have ever had diverticulitis which I haven’t, now she suspects that what it is, put me on 2 antibiotics and this morning it was starting to feel better but nights it gets worse. Does anyone else feel it gets worse in the evening? And how long do you have to be on antibiotics for this to clear up? The only thing I’ve eaten in a week is applesauce, toast & banana. Lost 5 lbs already but this is not how I wanted to lose it. And can the Dr diagnosis it as diverticulitis without further tests? So tired of being in bed & restricted diet! In October 2018, I had a CT Scan due to severe pain in my left rib age area. Scan results were diverticulitis in the curved part of the descending colon. My gallbladder was removed in 2000… had a colonoscopy in December 2018, and since then, I have had horrible discomfort in my abdomen right side, plus lots of gas and diarrhea. I have tried eating the diet as suggested by the gastro doctor, but that gives me diarrhea constantly. Also, it is worth noting…the gastro doctor said, he didn’t think the Scan was correct, he felt I am lactose intolerant. Didn’t listen to me when I said…I don’t do dairy. Now, for the past 3 days, I have had diarrhea, horrible discomfort in the abdomen and exhausted. Any suggestions on what to eat? Should I see a different doctor? Open to any suggestions! My symptoms are much likes Joyce’s. On Friday I had a strong pain in my lower abdomen while I was driving. Came home an hour later and had a bowel movement. I had to keep pushing and it was weird because my body almost made me push more like having a baby. I woke up Saturday morning with cramping and bloating. I managed to go to work. Later that night I started having more severe pains in my lower abdomen. Sunday morning came and I could hardly move. My skin even ached. I went to the doctor and he told me to go the ER, but I don’t have insurance. He was concerned because I had a fever with severe abdominal pain. After I told him I could not afford to do that he said he will prescribe me some medications and that he felt I had Diverticulitis. Also said that if I didn’t get better in a couple of days then I needed to get to the hospital. I did feel better this morning and then this afternoon and evening it seems I got worse. I don’t know what to do. I’m reading everyone’s situation and it’s exactly what I have. The same symptoms. I don’t want the huge medical bill of an ER visit if I don’t need to go. Just need to know how long will these cramps last since I am on two different antibiotics. Andy help would be appreciated. I was going through similar pains associated with food that came on slowly with some symptoms and some wax and wane with FODMAP foods. Using an SCD diet or LOW FODMAP diet helps with pain, taking oregano oil helps me with upper intestinal gas that comes on shortly after eating. Im trying to kill this infection now with SIBO type treatments. Good luck to you all and happy googling. Hint: all of the capital letters will give you alot of info. To kill this it needs to be in steps of killing the infection through many different routes at the same time, but most importantly, use a very low carb diet during the kill phase and use intermittent fasting always. I do eat nuts in moderation but, do my best to drink milk or eat it in cereals seeded fruits i hardly ever do like black berries or straw berries and stay away from whole kernal corn thats the hardest on my system! So hubby was Dx with diverticulitis he is on medication not past 4 days was in hospital for 2 days. He said went in with pain level 10 now pain level is still between 8-4. He also sweats a lot we are just a little worried since leukemia runs in his family some of these symptoms are similar? Can someone tell me if it is this normal to continue having the pain and having 1-2 sweat attacks per day? I am going through another bout of diverticulitis. More fiber is a mistake. You got the disease because of a lifetime of low fiber intake and now the intestines cannot process it. Stay away from all berries, roasted nuts, popcorn, seeds, and don’t eat a lot of salads. It is just too much fiber for the intestines to handle. My chiropractor recommended I go to the health food store to get refrigerated probiotics. The directions are to take 1/2 teaspoon (about 2 mL) twice a day. However, during a bout of diverticulitis, he said to take 1 Tablespoon (about 15 mL) three times a day with apple juice. I am to avoid all dairy, which is easy when you are only having juice, water, or black unsweetened coffee. On Day 2, I felt 50% better! I would also recommend glycerin suppositories to keep from getting constipated. That just makes everything worse. The important thing is to stop eating to give your intestines some relief while it is fighting the infection. Obviously, these suggestions do not apply to anyone whose intestines have been perforated by the diverticulosis, as you need to get to an emergency facility before getting sepsis. I’ve never had before. I have been trying to kill it with the antibiotics and ACV. Was wondering if anyone had success with ACV? Also wondering if anyone ever got dizzy ftom the antibiotics? I have severe pain in the right side near my ribs. Pain so intense that I cannot sit still. I have had a colonoscopy and endoscopic test. No problems no ulcer. I have had Six attacks in the last 5 weeks. Could this be my gallbladder? I have had constant diverticulitis bouts for about 3 years. I had an acute diver about 10 years ago. My version is more chronic as it happens pretty much weekly with the “twinges” on left side low abdominal. I find that liquid diet is good – sometimes only 24hrs is needed. Do not stay on liquids more than 3 days (other problems with come along)…my pain is usually worse at night as well. A “bedbuddy” or moist heat will help with the pain. I also take Tylenol Arthritis (8hr) at night. I try and not take the antibiotics since they are so bad for you. I take VSL#3 and Florstor as prescribed by my gastro doc. I also stay away from nuts (altho have started to eat walnuts here and there since they are a soft nut) popcorn and corn. i do however eat strawberries blueberries eggplant and tomatoes which doesn’s seem to coincide with an attack. Wondering if anyone has tried medical marijuana? Oh my God I am suffering the pain right now. I’m on two antibiotics. I cant wait for the pain to stop. Its horrible!! I am on day 3. not much relief. always exercised. always ate fiber. This is absolute craziness. constant pain. hate antibiotics. when will this end? You are not alone, started a week ago. I had an endoscopy on Friday was told not cancerous which I was worried about,I have had dyharea for six weeks now and waiting for the biopsy results.then on Saturday I bought some charcoal tabs from chemist on Sunday my wind abated and my stools more solid ?????????? Thank you every one for the contributions; I thought that I had IBS for decades and then had a diverticulitis attack a year ago and still suffer some pain almost daily; today has been a nightmare. I can’t believe how tired I get and I thought that it was age creeping up (58 yrs old) but probably diverticulitis is the real cause? I just was diagnosed with diverticulitis – after being admitted to ER with fever and severe abdominal pain. I don’t think its a coincidence that a couple days earlier I had a handful of Pepita nuts on a salad. So much for the theory that nuts are ok. I also have gluten and dairy intolerance. I had “cheated” a little for a few days and this may have been the perfect storm to set off this illness. I am sticking to a high fiber, gluten free, dairy free diet without nuts – though I love them. I am home recuperating and am having mostly consuming just liquids for a few days to help my gut heal – smoothies and soups.